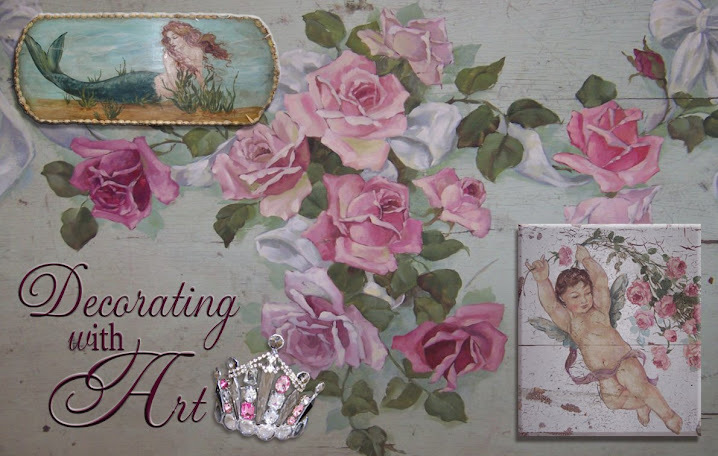 Decorating With Art: A Glittery Day! What a wonderful, glittery show on Saturday -- Spring Glitterfest 2010 was a smashing success. Each show is getting bigger and better! Thanks to the amazing Whimsy girls -- Sheryl and Dianne once again outdid themselves. They never cease to amaze me, all the time and hard work they put into it. I'm so lucky to know them -- not only because of Glitterfest, but also the Whimzy store, and their flea-market (I always seem to drop a load of cash there every time!! ).....but mainly because they are such good people. You can't help but like them, and we have so much fun together! I also want to thank all the wonderful customers -- whether you are returning customers or new ones, you helped make the show a big success for me! I so look forward to Fall Glitterfest on October 2nd -- see you there!! Now I need to get back into the studio to catch up on my space in Country Roads!! Hi Lori, I agree Sheryl & Di are the BEST and Glitterfest was the BEST!! I can't wait until the next show. Your display was fantastic! My MIL saw me go crazy over this hand-painted bag you have pictured(the one done in red and turquoise)and she was so sweet and gifted it to me! I can't wait till next Glitterfest, maybe I'll get one of those beautiful hand-painted bangles to go with my bag :) It's always so difficult to choose since all your creations are breathtaking. What a nice dispay did you had. I love your work aspecially the handbag with the lady and the rose on it and the painting of the yorkshire terrier and also the mermaid on the mirror and also....i can go on and on, you made a lot.